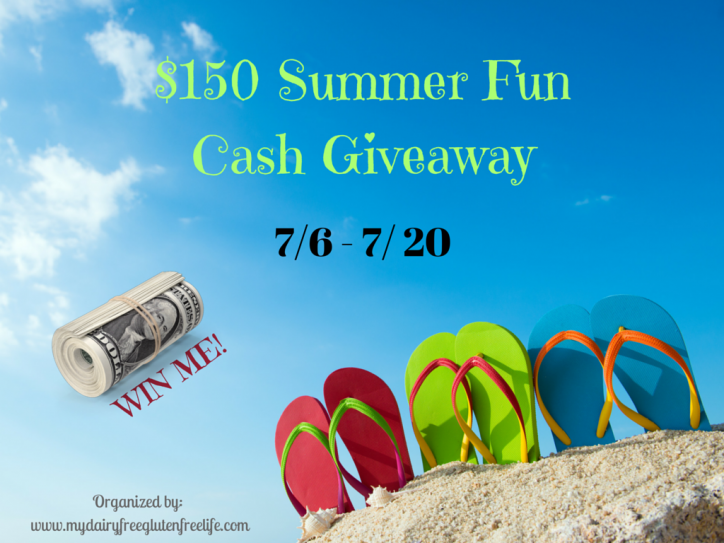 $150 Summer Fun Cash Giveaway! Summer is here and everyone could use an extra $150! To help celebrate our summer fun , we have joined with a group of great bloggers in bringing you a $150 Summer Fun Cash Giveaway! Who wouldn’t like a little extra moola to help pay for summer fun events, food, clothes or whatever you need help with! Please post in the comments what you would use the extra $$ for this summer! I would love to hear about it. This Cash Giveaway is a Blogger Sponsored Event which means the bloggers – who you will find on the Rafflecopter for entry options – have donated money to help pay for this prize! One lucky reader will win their choice of a $150 Amazon Gift Card or Code OR PayPal Cash for $150! This giveaway is open WorldWide and ends July 20, 2016 at 12:00 AM EST. Disclaimer: This blog and any participating blogs did not receive compensation for the published material in this post. No purchase required to enter this giveaway and there is a limit of one entrant per household. Void where prohibited. Odds of winning are determined by the number of valid entries received. Winner will be chosen by Random.org and will be emailed via the email address used to enter the contest. New winner(s) will be chosen if original winner(s) has not responded within 48 hours of email notification. My Dairy-Free Gluten-Free Life is responsible for shipment of prize. This giveaway is not administered, sponsored, endorsed by, or associated with Facebook, Twitter, Google, Pinterest or other social media outlet. Disclaimer is posted in accordance with the Federal Trade Commission 10 CFR, Part 255 Guides Concerning the Use of Endorsements and Testimonials in Advertising. Leave a comment: What would you spend $150 on if you won? Filed Under: EASY, Give Away!, GIVEAWAY Tagged With: Giveaway!! Gas for going to various whitewater rivers to kayak! I’m going on vacation in August, so I’d save it to use there, on a nice dinner out! I would get a blendtec blender! I would start my Christmas shopping for my grandson. So many things. I guess I would have to say something that would relate to food outside. Meat for the BBQ; potatoes for a potato salad. Whatever strikes me when the card arrives! I would buy clothes for my new job! I would buy another Kitchenaide mixer bowl and another paddle attachment., would help with not washing so many dishes for your wonderful recipes!! Oooh, how fun! I would use those dollars to put towards a plane ticket to fly & see my folks!! We are closing on our house the end of this month so the money would be so helpful to get so some work done.